Wells Fargo announced the setting of some lofty 2020 “green” goals last week, testament to financial industry players’ growing commitments to financing renewable energy, clean technology and environmental initiatives. The San Francisco banking and financial services group April 23 announced that, by 2020, it intends to make $30 billion in “green economy” loans and investments, $100 million in community grants for grassroots environmental initiatives and an increasing of the group’s own energy efficiency by 40%. The results of its own consumer research played a big role in management formulating its green economy lending and investment and community-focused environmental initiatives. “Our research shows more than 80 percent of our consumers think environmental issues are important,” said Mary Wenzel, Wells Fargo’s director of Environmental Affairs. More information is available on the Wells Fargo Environmental Forum. A new study commissioned by Sunrun finds that a whopping 97% of Americans overestimate the upfront cost of installing rooftop solar panels. Meanwhile, of course, 8 out of 10 of those without solar say they would install it if cost weren’t a factor. The study was conducted online by Harris Interactive® in February 2012. 2,211 U.S. adults participated in the study, and 1,475 of them were identified as homeowners. While people are concerned about rising utility prices, most do not realize that solar can chip off a big chunk of those costs and that solar essential means more money for them in the long run (and, if they decide to go the solar leasing option Sunrun is focused on, perhaps even immediate savings). It seems that for this reason, and probably largely because of good marketing as well, most people going solar in California (the #1 state for solar power) are going solar via a third-party service (i.e. a solar lease or a solar PPA). No matter how you go solar, though, I think the point of the matter very simply is that there are a variety of options available these days, and they all offer good financial returns for a large number of people, probably most people. If you’re thinking of going solar, certainly don’t assume it’s too expensive and dolook into the options available to you. Lux Research has just released a report on the most productive solar panel (or solar module) manufacturers in 2011. The Solar Supply Tracker report notes that the top 10 solar panel manufacturers produced 12.5 GW of solar panels in 2011, 44% of the global market sector. Japanese and South Korean solar panel companies rose in ranks in 2011, Lux Research also notes, with the two countries moving forward with strong solar power policies about as fast as any other country. “Expect to see a major rise in market share from Japanese and Korean suppliers, while European module manufacturers struggle with financial woes and reduced government incentives for solar in Europe,” Fatima Toor, the Lux Research Analyst who led the Solar Supply Tracker, added. Available only from Lux Research, the Solar Supply Tracker provides a customizable platform for tracking the capacity and production of five key value chain segments in photovoltaics: polysilicon, ingot, wafer, cell and module. The cell and module segments track crystalline silicon (x-Si), thin-film silicon (TF-Si), copper indium gallium selenide (CIGS), cadmium telluride (CdTe) and organic photovoltaic (OPV) companies, while the polysilicon, ingot and wafer value chain segments are specific to x-Si. Lux Research tracks over 400 companies globally across all value chain segments. Technology developed at CERN for use in particle accelerators has led to the creation of a specific type of solar panel that was delivered to Geneva International Airport on Friday, for what will become one of the largest solar energy systems in Switzerland. 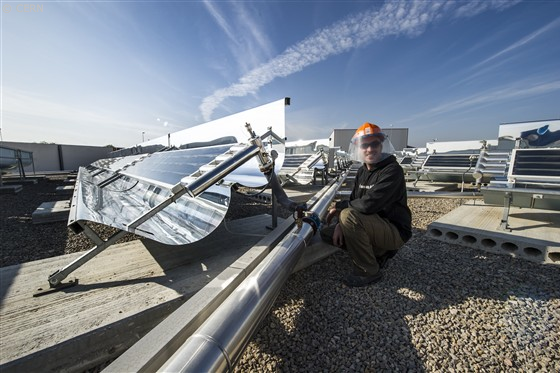 In the end, some 300 high-temperature solar thermal panels will cover a surface of 1200 square metres on the roof of the Geneva International Airport’s main terminal building. The panels will be used to keep the buildings warm during the winter and cool during the summer. And these panels are a direct descendant of technology that was developed for accelerating and colliding particles for science. Particle beams can circulate only in pipes from which the air has been removed, otherwise they would quickly be stopped. Vacuum technologies were therefore developed to meet the needs of the accelerators. For colliders, where accelerated particles are made to collide with each other, a high-grade vacuum is even more important. This is because they have beams of particles running for hours at a time, with a few particles actually colliding at any given crossing point. The world’s first proton-proton collider, the Intersecting Storage Rings (ISR), began operation at CERN in 1971, marking the start of ultra-high vacuum research at the Laboratory. At the end of the 1980s, CERN’s Large Electron–Positron collider (LEP) was setting new vacuum records, thanks to the use of 20 kilometres of getter strips, a material which attracts residual gas molecules like bugs to flypaper. But it was the marriage of thin-film coating techniques with getter technology for the LHC in the 1990s that paved the way for solar panel applications. As a result of this technology, the ultra-high vacuum created within the panels’ heat chambers provides amazing insulation. “We’ve had temperatures of 80°C inside the panel when the panels were covered in snow,” says Benvenuti. Cristoforo Benvenuti proposed getter vacuum technology for LEP, and patented the technology of thin-film getter coating for CERN. CERN has made licences available to commercial companies in its Member States. In 2005, the Spanish automotive company Grupo Segura teamed up with Benvenuti to form SRB Energy. The company obtained a licence to exploit the technology, and production facilities were built near Valencia. Its R&D activities are still based at CERN in Meyrin (Switzerland). SunPower, a leading manufacturer of high-efficiency solar cells, solar panels, and solar systems based in Silicon Valley, and GRID Alternatives, a non-profit solar installer in the Bay Area, have teamed up to put SunPower’s high-efficiency solar panel rooftop system on low-income homes in San Francisco. 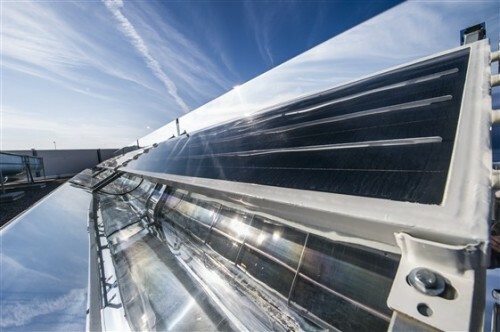 “Under terms of the supplier agreement, SunPower will provide GRID Alternatives with its high efficiency solar panels through a combination of donations and fair market value sales,” a recent news release stated. However, this isn’t the first time SunPower and GRID Alternatives have teamed up. They’ve got a (in the solar industry) long relationship in this arena. “SunPower has worked with GRID Alternatives for the past six years to help hundreds of families in need, providing more than 1,000 employee volunteer hours, philanthropic gifts, equipment donations and sales. This partnership is expected to generate a combined $10 million in electricity savings for these families over the life of the systems.” That’s impressive. GRID Alternatives has power with other solar panel providers, as well, over the years. “Since 2004, GRID Alternatives has installed over 1700 solar electric systems and provided hands-on solar installation training over 8000 community members statewide. These systems represent over 4.7 MW of generating capacity, which translates to over $44 million in energy cost savings over the systems’ projected life spans, while preventing 148,000 tons of greenhouse gas emissions.” There are many non-profits out there that are worthy of support, but this one definitely deserves a spot at the top. In addition to the work above, GRID Alternatives manages the Single-family Affordable Solar Homes (SASH) Program, which is part of the California Solar Initiative. SunPower tops the chartswhen it comes to residential solar installations in California, and it achieved the Guinness Book of World Records Award for “the most efficient commercially available photovoltaic modules on the market” last year. Its solar panels will benefit these low-income residents a ton. Kudos to SunPower and GRID Alternatives for this great partnership and work.